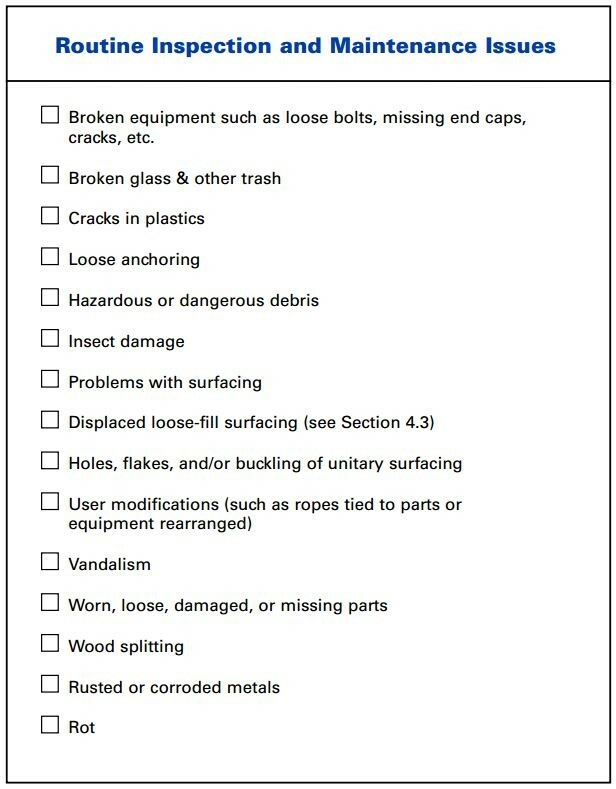 Have You Had Your Playground Inspected? We all know it’s important to have buildings and homes inspected. It’s equally important to have a structural engineer inspection for your local playgrounds. Playgrounds are popular recreational outlets for families with children. Municipalities, schools, neighborhoods and more are increasingly building larger playgrounds with many features designed to keep children active. Playgrounds are designed with the safety of children in mind. However, the playgrounds do require routine maintenance and periodic inspections to ensure the equipment remains safe. The United States Consumer Product Safety Commission has published the “Public Playground Safety Handbook”. The handbook outlines parameters for site & equipment selection for new playgrounds, as well as, detailing a maintenance program for existing playgrounds. The graphic on the right outlines general items that should be reviewed during a routine maintenance inspection. It is important to note, other items not specifically addressed below may need review depending on the type of equipment, site, etc. The frequency of maintenance inspections varies with the amount of traffic a playground sees. Playgrounds frequently serving a large number of children (i.e. schools) should be reviewed at more frequent intervals than smaller, less used playgrounds. Structural Innovations can assist in reviewing playgrounds to ensure they comply with the US Consumer Product Safety Commission’s guidelines and other industry standards. We work with property management companies, school boards, municipalities, homeowners associations (HOA’s) and others.